I would love to know what kind of tree is in the right foreground of this picture. Does anyone have any idea? Nope - offhand, at least. Where is it sited? I don't know, osso. 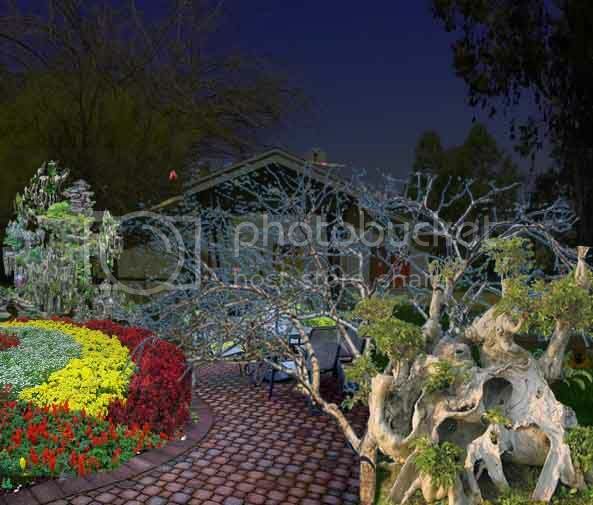 I think Ragman could be right since the photo does say China landscaping on it. 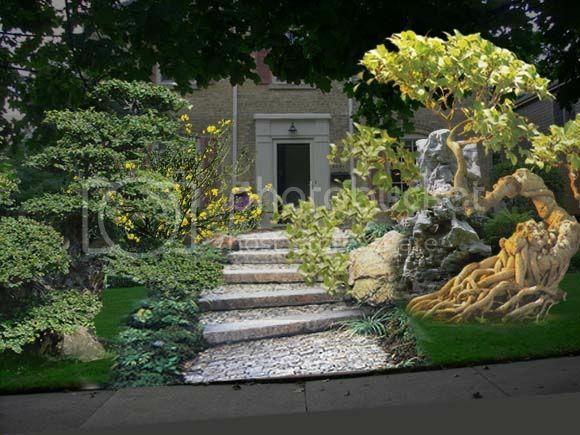 I was looking up idea for a front walkway and came across this photo. That tree is so beautiful and unlike anything I've seen before. I'm very curious as to what it might be. I thought of banyan but it doesn't fit my memory (spare) of what those look like. I too picked up on asian/china, first because of banyan, and then the photo url. Well, that says underground and I googled visible roots. Huh. I'm not even sure you'd call that a tree. 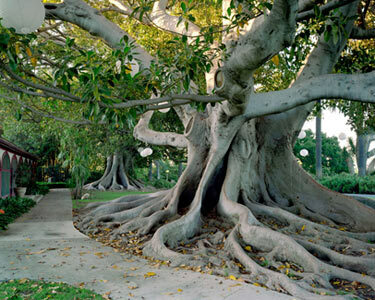 It kind of reminds me of the fig trees I saw growing in Santa Barbara. Do you think it could be some kind of fig tree? If you look into the photobucket album the pic comes from, you'll see that not all of the plants are real or scaled naturally. This could easily be a bonsai that's been scaled up. At least a few of the pix are amalgalms of plants/houses/landscaping and some drawing/photoshopping (it reminds me a lot of the landscapes neohihp used to like creating). I just fell in love with that tree and now I know it might not even be real (sob). I was thinking bonsai, just because it's so perfect. No - I know all the ficus trees pretty well. Maybe it's a bonsai fig tree! Yeah.. seeing them together makes me think it's not. Looking at the leaf, my first impression was Catalpa (Bean tree), but I've never seen one with roots like that. Could certainly be a japanese or chinese growing system similar to bonsai? A close up of leaf would be good. I think it's a something top of photo with a something rooty bottom of photo. But, what do I know? Anyway, the roots are interesting. A member of the strangler fig family, maybe. Does someone disagree with me? I would be fine to hear why. I am doubting it is a Ficus, as I said, but I can't just prove it, not knowing enough. The top and the bottom do not make sense together... I think whoever worked the photo, as Boom mentioned, is pretty smart. » Does anyone know what kind of tree this is?